Luxurious Velvet in a soft blush hue beckons old time glamour while still feeling fresh and chic. 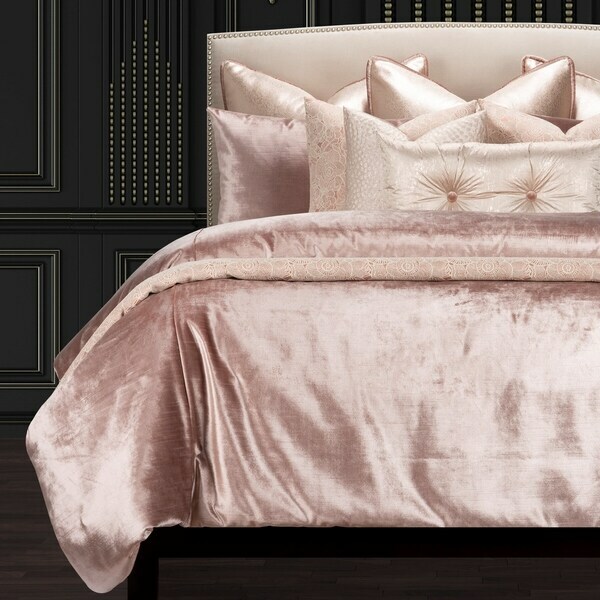 The scrumptiously soft velvet has an opulent shine that combines show stopping looks with ultimate comfort. Snuggle in style with the Breakfast In Bed Luxury Duvet Set from F. Scott Fitzgerald. The duvet cover is backed with luxuriously soft sheeting reminiscent of silk that is a dream to sleep under. The duvet cover and shams both have zipper closures for easy removal and care. This posh duvet cover features a zipper closure at the bottom and 8 buttons inside that will hold your included duvet secure inside the duvet cover. This will ensure that it does not shift while you sleep and will keep it looking flat and neat when the bed is made. The matching bed shams also have a zipper closure to help make the cleaning process painless and simple. The two included toss pillows introduce added texture and style that will give your bed that refined chic look you have been yearning for. You can feel confident with your investment in this luxury set knowing that it has been cut and sewn, from start to finish, in our warehouse in Minnesota giving you a high-end quality that will last through the years. The duvet cover is filled with our eco-friendly down alternative comforter. Stuffed with a medium-weight fill made from recycled plastic bottles, this cozy comforter benefits your health and the environment when compared to natural down. The ultra-soft white polyester cover on this eco-friendly comforter cleans in the washing machine, making maintenance easy. This luxurious comforter is designed to keep you warm all year round. Dimensions 98.0 In. X 104.0 In. X 3.0 In. "Where can you buy the coordinating pillows?"